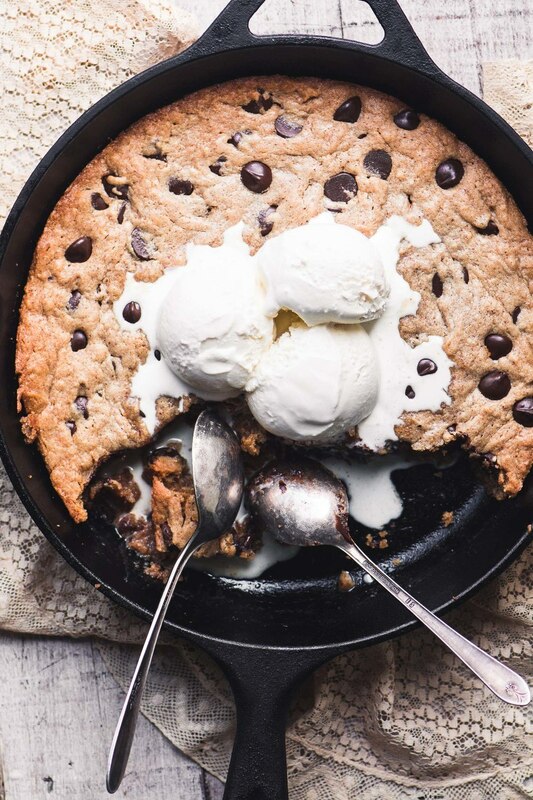 These Almond Butter Skillet Blondies are an easy one bowl skillet dessert that makes a quick treat for the family, or the perfect ending to a romantic evening. Or maybe both! Butter a 9 inch cast iron skillet. Whisk together the melted butter, sugars, and almond butter until smooth and creamy. Stir in the flour and salt, and then fold in the chocolate chips. I like to reserve a few to poke into the top of the batter before it bakes. Spread the batter evenly into to skillet, and bake for about 25-28 minutes, just until it's starting to set around the edges, and get a slight hint of golden around the edges, too. Don't over bake, better to take it out too early than too late. Enjoy while still warm with ice cream, or let it cool and slice.